I fear I've gone a bit nuts with interlibrary loan. I just finished reading Octavia Butler's Wild Seed, which is from ILL, and I have True Names and Corum: The Coming of Chaos also out from ILL. Three books, no bigggie. Only, with ILL, I can't renew. At least, I don't think so. And the borrowing window is much shorter. Somehow, I missed that the edition of True Names I linked above is available at my library. Like, as a regular book. With renewals. Figures. The edition I have out is a novella edition only, so much shorter. No trouble finishing that in time. But, I have an abundance of regular library books out. Oh...In Transit from ILL: Wild Cards, and Starship: Pirate. That's not all, o, no no. Being processed by the lending libraries are the following: Dreams of Steel, Walpurgis III, Clay's Ark, and The Bachman Books (a collection of the first four novels Stephen King wrote as Richard Bachman). What is wrong with me? Do I not have enough books at home? Has my lending library run out of books? I just think of something ELSE I would like to read, realize that my library doesn't have it, and get all giddy with getting stuff from ILL. And THEN I think of something else. 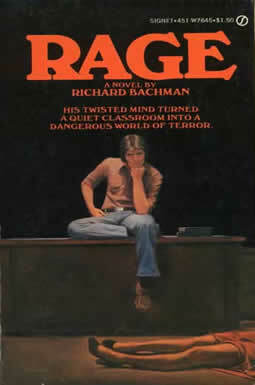 Shoot, I only reserved the Bachman collection because my library doesn't have Rage, and ILL doesn't have it as an individual volume. I'll probably read them all. NOTE: Because of the sensitive nature of the content of this book and its association with school shootings in the United States, Stephen has decided to prohibit any future printings of this book. That makes sense, though it is too bad. Stephen King as a cultural influence for school shootings? Doesn't that mean he should quit publishing Apt Pupil and yank copies of the movie? ILL will let you renew, but you have to call them and directly ask for the renewal. Sometimes you'll even get longer than the original checkout time on the book. My wife has done this a few times so she can read something I particularly liked - saves the system the cost of sending the thing back and forth. I think that King as an honest influence on school shootings is a stretch, but I suspect King was just uncomfortable with even the association and he's got enough money and books in print to not need the income from Rage. Such as it is. Apt Pupil is safe because it isn't so much a story built around school shootings (I don't think, it's been a few years), and also as a story it is only part of a collection and not sold individually. It's low profile King, even when the movie was released. But there is a teenager. And there's shooting of innocent people in the end - on an overpass if I remember right. And there have been a couple cases of snipers running amuck in the U.S., including younger ones influenced by older creepy guys (D.C.) which could be seen as a parallel. I'm just saying that if you believe you influence the one type of event, why would you believe you don't influence the other type of event? I get what you're saying. I think it is the direct tie to the event. Apt Pupil, to the best of my knowledge, isn't tied to any shootings. If we go to the page for Rage at that bastion for documented truth (!) there is this reference to Rage and shootings. King wouldn't have control over the film, but I suspect if Apt Pupil had been tied to acts of violence like this he would pull Different Seasons out of publication.